The television show ‘Harbor Command’, starring Wendell Cory as Captain Ralph Baxter, ran from the fall of 1957 until the summer of 1958. 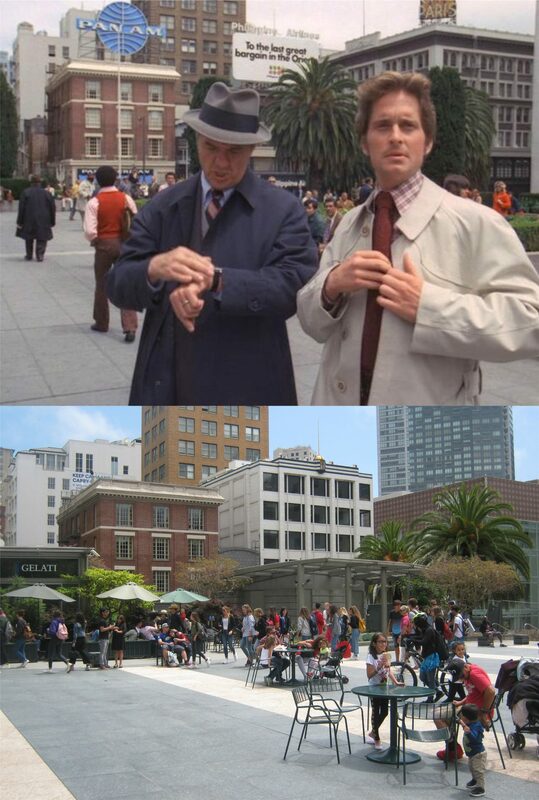 Most of the episodes were filmed around the Embarcadero, but in the episode ‘Lovers’ Lane Bandits’ the Harbor Command takes a trip to the Richmond District. A teenage girl, who attends George Washington High School in the Richmond District, sneaks out of the house after she’s been grounded to meet her boyfriend at a “lovers’ lane’ near the Pesidio. She witnesses a murder there, and, unfortunately for her, one of the killers has seen her, although she doesn’t know that. Captain Baxter learns about the girl through detective work and is desperately trying to find her before the killers do. Baxter goes to the old Playland-at-the-Beach amusement park to talk to her father who works there. Baxter and his partner park at the Cabrillo streetcar turnaround near the Funhouse. The bottom picture is where they entered Playland from the Great Highway today. Baxter questions a fellow who works at the Funhouse to find out where the girl’s father is. This scene has an extremely rare shot of Laffing Sal in action at the Playland Funhouse. Behind them is the Playland Merry-go-round. The merry-go-round is still in operation today at the Yerba Buena Center. This is about the spot where the Funhouse once was. Baxter learns from her father that she’s meeting a friend at a drug store at Balboa Street and 42nd Avenue. Here, the two girls leave the drugstore heading west toward the beach. This is the northeast corner where the girls were walking today. I couldn’t get the same line up on the corner because of parked cars. The killers stalk behind them in a truck. When we next see the two girls they’re at the corner of Balboa and 37th, five blocks east in the opposite direction from where they were heading the last time we saw them. The girl with the light hair has a real problem; she’s witnessed a murder and she knows she should tell someone, but her dad had grounded her and when he finds out she sneaked out she’s sure he’ll just kill her! Hey, honey, turn around! Your dad probably won’t kill you, but the two guys in the truck behind you will! When her friend goes into the market on the corner one of the killers grabs her. Oh, oh, this doesn’t look good! Somebody had better learn to obey her dad in the future. Her friend comes out of the store to find that she’s disappeared. This was at the northwest corner of Balboa Street and 37th Avenue. But this teenager has a guardian angel, Ralph Baxter, approaching the corner where she was taken north from 37th Avenue. Her worried friend tells Baxter the direction they went. The bad guys turn north off Balboa onto 40th Avenue. Harbor Command misses the turn at 40th and in a action reminiscent to the chase scene in ‘Bullitt’ burn up rubber backing up to 40th Avenue. They head up 40th to Geary Blvd. On Point Lobos Road the Harbor Command police cut the truck off right about here, just down from the Cliff House. As Baxter and his partner approach the truck, they threaten to shoot the girl if the officers don’t back away. When the teenager faints, (well, I probably would have too) Baxter gets a clear line of fire and shoots the man with the gun. That’s Sutro Heights behind him. He pulls the driver out of the truck, and case closed. The two videos below are the Funhouse scene from the show, and Laffing Sal today in Pier 45 at Fisherman’s Wharf. They say it’s the same one; judge for yourself. Today is the one hundred and thirteenth anniversary of the 1906 Earthquake and Fire in San Francisco. For the first time in awhile they didn’t extend the April 15th tax filing deadline so I was able to go over to San Francisco on the day before the anniversary to take some pictures. These are location shots of high density photographs of the disaster, many of them from the Shorpy Archives vintage picture collection. We’ll start at the foot of Market Street looking west. The crowned Call Bulletin Newspaper Building, the tallest building in San Francisco at the time, can be seen in the far background on the left in the vintage picture. That was the ruins of an interesting looking building where the Hyatt Regency is today on the right. New Montgomery and Mission Streets, looking north toward Market Street showing the ruins of the Palace Hotel and the rebuilt Palace Hotel there today. The building in the background is the one on the right in the previous vintage picture taken at Market and Montgomery Streets. We’ve moved north to Pine Street looking east past Kearny Street. That’s the Bank of America Building on the left center in the current picture. We’re up on the top of Nob Hill now. That’s the gutted James Flood mansion, the only mansion on Nob Hill to survive the earthquake and fire. I don’t mind a cable car photo bombing one of my pictures any time. The Flood mansion is now the exclusive Pacific Union Club. Looking toward the south western corner of California and Powell Streets where Leland Stanford’s mansion stood. Farther up California Street are the ruins of Mark Hopkins home, now the Mark Hopkins Hotel. Refugees heading east and west along Market Street near 3rd: The Ferry Building is in the background. It’s interesting how most of them are following traffic rules and staying on the right in both directions. And, of course, most San Franciscans favorite survivor, the Ferry Building; roughed up, but she took it well. In spite of these monstrosities they’re putting up nowadays, like the Sales Force Tower, the Ferry Building is still the “Grande Dame” of San Francisco. Photoshop is a great computer program that even an amateur like me can have fun experimenting with, but you have to leave a lot out to get a decent fade in with then and now pictures. This set is a Photoshop collection of pictures of mine along with the original photos; sort of comparing two comparison types of comparison pictures. A hoodlum kidnaps Vincent Parry (Humphrey Bogart) and drives him to a spot below the southern entrance to the Golden Gate Bridge in the 1947 film ‘Dark Passage’. Since September 11th 2001, this area has been off limits to the public. Orson Welles exits the Funhouse at Playland-at-the-Beach leaving a dying Rita Hayworth inside in another 1947 movie ‘The Lady from Shanghai’. Welles is walking toward the Great Highway. Playland was demolished in 1972. After being shot twice and left in an empty prison cell on Alcatraz by John Vernon and Angie Dickinson, Lee Marvin recovers consciousness and swims back to San Francisco from Alcatraz with two bullets in him to seek revenge. That’s quite a feat! The move was ‘Point Blank’ from 1967. The modern picture is the current San Francisco skyline from Alcatraz Island. Lana Turner enters the old I Magnin Department Store on Geary Blvd. across the street from Union Square in “Portrait in Black’ from 1960. This is an effort to establish her alibi while she plots with Anthony Quinn to kill her husband. In the background is the St. Francis Hotel on Powell Street. “Look out!” Almost a head on crash with a cable car and an automobile at Hyde and Greenwich on Russian Hill: The vintage picture is a Fred Lyon photo from the 1950’s. This picture is sometimes labeled as looking toward Telegraph Hill from Lombard Street at Hyde, but it’s not. Fisherman’s Wharf Boat Lagoon in 1939 in a picture from the Charles Cushman Collection. In the background of the vintage picture is the large gas tank near Fisherman’s Wharf located there from the early 1930’s to the 1960’s. ‘Harbor Command’ was a thirty minute television show that ran from October of 1957 until July of 1958. The show starred Wendell Corey as police captain Ralph Baxter. You may recognize Wendell Corey as the fall guy in a 1949 movie shown regularly at Christmastime called ‘Holiday Affair’ with Robert Mitchum and Janet Leigh. The TV show has some terrific San Francisco locations, mostly along the San Francisco waterfront. Harbor Command was a fictional law enforcement agency that worked along with the Coast Guard. Their headquarters was located in the Ferry Building. The Embarcadero Freeway was being built during filming of the show and construction of the highway can be seen on the left. Baxter and another officer in pursuit of a mob leader are shown at the entrance to the old Pier 39. In 1978 the pier was demolished and the tourist attraction that’s there today was built on the old foundation of the pier. The bottom photo is the entrance to pier 39 today. The same episode with the previous picture ends with a shoot-out that resulted in Baxter killing the mob boss on the eastern side of Pier 39. Below is the eastern side of Pier 39 today. A shoot-out with Ralph Baxter is a poor prospect, as another bad guy taking cover in the background learns on the old Van Ness Pier in the episode titled ‘Contraband Diamonds’. In ‘The Final Score’ a fugitive falsely identified as a murderer climbs the old public announcement tower on the west side of the Maritime Museum and shoots back at pursuing Harbor Command police. The Harbor Command police return fire, and the bottom photo is the tower today. Don’t worry, this one ends happily and the innocent man is cleared. In the same episode as the previous picture, as the police pursue the fugitive a sinking ferryboat is shown in Aquatic Park near the Maritime Museum. I’ll have to research what that was all about. The old and now closed snack bar and restroom building can be seen on the right in both photos. In ‘Smallpox’ a man with a vendetta and out to kill the man who framed him, approaches Beach Street from Hyde. He is unaware that he has smallpox and may be infecting many people in San Francisco. The camera moves up to show the location is where the Buena Vista Café is. The Buena Vista is still there but with a different sign now. Later in the ‘Smallpox’ episode, the carrier is shown at the corner of Jefferson and Powell Streets going in to the old Eagle Café. A parking garage for Pier 39 was built on the corner where the Eagle Café was located in the top photo. The Eagle Café was rescued from demolishment and moved across the street and relocated at the top level of Pier 39, shown in the bottom photo. In one clever episode entitled ‘Gold Smugglers’ two dental assistants have been forging the doctor’s signature to order gold shipments delivered to his office. They have used the dentist’s molding plates to shape the gold into hubcaps in an attempt to smuggle the gold out of San Francisco on a car ferry. When the doctor discovers their plan they kill him. Here they are seen parking in from of Pier 17 on the Embarcadero where the Exploratorium is now located. The episode ‘Clay Pigeon’ ends in a shoot-out in the southern wing of the Ferry Building with Baxter and his partner chasing a parolee who has been trying to kill Baxter for sending him to prison. Maybe not as loud as gunfire, but it’s a lot noisier in this section of the Ferry Building today. Morton Alley on St. Patrick’s Day 1948, and all dressed up at Christmastime nowadays: Morton Alley was the original name for Maiden Lane, just off Union Square. The name of the street was changed to Maiden Lane after the 1906 Earthquake. No offense to Lombard Street, but I don’t see why more tourists don’t flock to Maiden Lane as well as Lombard Street; it has a more interesting history. Somebody had a sense of humor when they renamed Maiden Lane. The “maidens” of Morton Alley were, well, let’s just say far from maidenly! Also, a green carnation for all of the lovely lasses who come in to the office over St. Patrick’s Day weekend and lots of Irish jokes. I’m part Irish so I can take that license. What do you call a tipsy Irishman bouncing off the walls? I’m getting tired of telling clients why The Tax Cuts and Jobs Act didn’t bring them good news on their 2018 tax returns, so I spent the afternoon yesterday not looking at any tax returns at all. Thanks to my assistant, Kendrick, who taught me how to use the Photoshop program, I had a chance to have some fun photoshopping movie location pictures I’ve posted in the past. Elisha Cook Jr., “Wilmer” in ‘The Maltese Falcon’, arrives at the Ferry Building on a mission to kill in the 1947 film ‘Born to Kill’. Ray Harryhaussen’s giant octopus devours the Ferry Building in the 1955 science fiction film ‘It Came From Beneath the Sea’. Walter Matthau and Bruce Dern approaching the intersection of Broadway and Kearny Street in the 1974 movie ‘The Laughing Policeman’. Steve McQueen chasing the hit men in the black Dodge Charger down the north side of Larkin Street on Russian Hill in the 1968 film ‘Bullitt’. That’s McQueen’s reflection in the rear view mirror. Charlie Chaplin, being chased along an unpaved Great Highway at Ocean Beach, backs into Count Chloride de Lime in his 1915 short film ‘Jitney Elopement’, produced in Niles, California. The building behind Charlie is still there. Lee Remick chases after Jack Lemmon along Market Street after hurting his feelings in ‘The Days of Wine and Roses’ from 1962: That’s the old PG&E Building they’re coming out of. You can see the old Embarcadero Freeway in the background of the movie image. Ah, the Cliff House that I loved the best from a scene near the end of one of my favorite San Francisco movies, 1958’s ‘The Lineup’. Glenn Ford, being chased by the police, exits Varennes Alley onto Union Street in North Beach in the 1949 crime thriller, ‘Mr. Soft Touch’. Barbara Lawrence walks down the stairs that so many millions of commuters arriving at the Ferry Building have walked down in the 1949 movie ‘Thieves Highway’. In its day, the Ferry Building was second in the world only the Charing Cross Station in London for passenger travel, and the stairs are still there. Valentina Cortese crashes her car at Montgomery Street and Montague Place on Telegraph Hill in ‘House on Telegraph Hill’ from 1951, although she survives. Her husband, Richard Basehart, has tampered with her brakes in an attempt to kill her. Valentina’s having a bad day! Frank Sinatra and Kim Novak wander off into the sunset behind the St. Francis Yacht Harbor in the Marina in ‘Pal Joey’ from 1957. That’s quite a sunset! There’s a Facebook page devoted to San Francisco nostalgia succinctly titled ‘San Francisco Remembered’. It posts vintage pictures of San Francisco that are contributed to the page by members who have joined the group. For nostalgic San Francisco photos on Facebook, San Francisco Remembered is at the top of the list. A number of the pictures contributed are from public sources, many of which I’ve covered on my site, but a number of them appear to be from personal collections and may not have been seen anywhere before. These are a few of the pictures from the group that I did a then and now on. I’ll list the contributors of the pictures as the source.